Departing at 7:15 am from the Hotel Massimo D’Azeglio by a deluxe coach, you will arrive in Assisi, ready to explore, at your own leisure, this small town surrounded by walls, built in the Middle Ages. Take your time to visit the Basilica of St. Francis, where you will see masterpieces by Giotto and Cimabue and, then, have free time for lunch (not included). Board on the bus to reach Siena, a Unesco World Heritage Site, world-known for the Palio, the historical horse race around the shell-shaped town square: Piazza del Campo. Next, you will continue on to Florence, where you will check in at your hotel before enjoying dinner and a well-earned night of rest. After breakfast, you will spend the day venturing around beautiful Florence, the “Cradle of Renaissance", where, with the help of Michelangelo, Italian art reached its pinnacle. Based on Etruscan-Roman origins, the city flourished in the Middle Ages as a free “Comune” and was further refined during the Renaissance. You will be fascinated by the uncountable monuments, churches, and buildings as Santa Maria del Fiore, more commonly referred to as the Duomo. On your visit, you will be amazed by its magnificent dome built by Filippo Brunelleschi. Cross a small piazza to see the “Campanile” tower (partly designed by Giotto) and the Baptistery, with its bronze doors where Michelangelo imagined the “Gates of Paradise.” In the heart of the city, you will see Piazza della Signoria, Palazzo della Signoria (also known as Palazzo Vecchio), and the Basilica of Santa Croce. Then you will have lunch in a Tuscan restaurant in Piazza Santa Croce. Spend the afternoon strolling the cobblestone streets of Florence on your own or take a short trip to Pisa (optional), one of the four main historical Marine Republics of Italy. There, you will tour the Piazza dei Miracoli with the Duomo, Pisa’s symbol “The Leaning Tower” and the Baptistery. 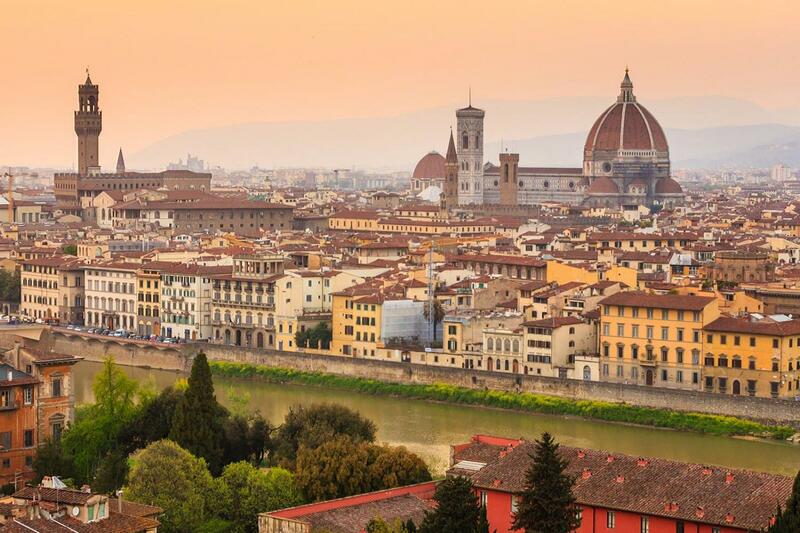 Have dinner at your leisure, overnight stay in Florence. After breakfast, you will depart from Piazzale Roma heading to Tuscany, world-known for its landscapes, its churches and castles, and its delicious wines. You will proceed to Val di Chiana with a stop in Montepulciano, a medieval town rich in history and art. Known for its “Nobile” wine, on purchase in local wine houses, Montepulciano also hosts an annual jazz and wine festival every July. Lunch included! Spend the afternoon discovering Montepulciano at your own pace, enjoying free wine tastings in many wine shops and free time for shopping. In the evening, you will arrive in Rome, where the tour ends. The tour director, Stefano was excellent and really funny. The pace was just nice and the package that I booked was a great deal. The tour was the best, conducted by Carrani Tours. The tour guide, Mirjam was very thorough, had a fantastic sense of humor, went out of the way to make it comfortable for all of us. She is very resourceful and made this tour a memorable one for us. Great driver and our tour guide (Stephano) was FABULOUS!!!!! Wonderful way to see some of the best places in Italy! So easy - Grayline does all of the work for you! !